The River House is located in Louisville, Kentucky. It is a custom residence, from ground up construction to completion. The site slopes from street level down to the river bank. The house itself is on a 100 year floodplain, so the design had to be able to adequately prevent flooding, collapse, or permanent lateral movement, which it successfully does. 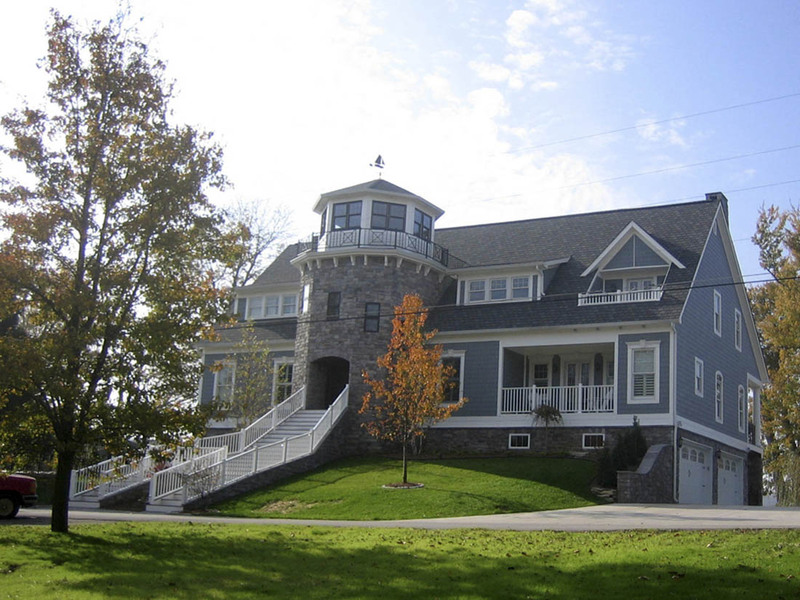 The 6800 sq ft house overlooking the Ohio River was inspired by the clients interest in the existing property and the client’s interest in New England architecture and lighthouses. The residence is outfitted with a large master suite, guest rooms, and living, dining and entertainment spaces. In addition – the library tower frames the entryway leading into the great room overlooking the river. The Tower also houses a grand spiral staircase leading the second floor followed by a book-shelved stairwell leading to a reading room at the top, which houses the client’s rare book collection framed by a 360 panoramic view of the town.